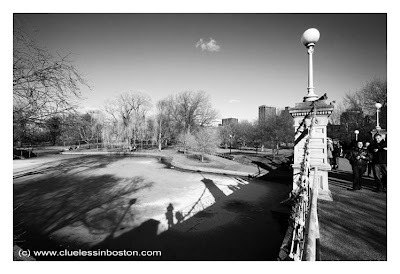 Winter shadows in black and white off the bridge in the Public Garden. I love this shot. There is something about shooting winter shots in gray scale that I love. Hope you had a wonderful New Year. I like the changes on your page. It looks nice. Thanks SS. I like the new look and photos on your blog too. I think the Public Garden is such a beautiful place, so i enjoy seeing any photos from there. The black and white just adds to it's allure. Do you take all of these pictures? Beautiful. Winter shadows are endlessly interesting. The lone cloud is a nice touch, too. Nice! Have you had issues with your mirror in the cold? Also, my hometown team (Sabres) did pretty well against the Bruins haha.